King Jaffe (James Earl Jones) just thinks Akeem wants to sow some pre-martial oats, so he grants a delay of 40 days before the royal wedding occurs. However, Akeem plans to find a bride on his own, so he sets out for New York with his pal Semmi (Arsenio Hall). After many misfires, he meets educated, sophisticated Lisa McDowell (Shari Headley) at a political rally. Akeem falls for her, and the rest of the movie follows his attempts to woo her. Coming reunited Murphy with director John Landis, the man behind 1983’s Trading Places, the actor’s second big hit. 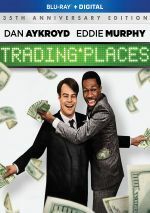 Coming snared Murphy and Landis another box office success, but it fell short of the amusement found in Places. I wouldn’t call Places a classic, as it ran too long and went down too many dead ends. Nonetheless, it consistently entertained and demonstrated an easy charm largely absent from Coming. Some of the problems come from Murphy’s ego, as the flick presents an indulgent fantasy with Murphy as pampered royalty, though maybe I shouldn’t knock Murphy for his decision to play a prince. After all, it’s not like he’s the first actor to take on such a role. Much of Coming suffers from excessive length and additional indulgence. At 116 minutes, it seems too long for a light comedy such as this, and too many scenes plod along past the point of no return. For instance, the African dance sequence at the betrothal ceremony runs forever without much purpose, and other bits like the “McDowell’s vs. McDonald’s” scene drag. We understand these gags without so much explanation, so the excessive discussion robs the pieces of their effectiveness. Other parts of the flick come across as little more than barely connected skits and chances for Murphy and Hall to play various characters. They don lots of makeup to portray various Americans, and these bits wear thin before too long. Some of them work – the barbershop guys get the movie’s best laughs – but we find too many of them. The gimmick gets old, and the fact that so few of the scenes make sense within the story doesn’t help. Again, I wouldn’t call Coming to America a bad flick. It presents a little charm along with a smattering of funny bits such as one memorable cameo I won’t mention so I won’t ruin the surprise. However, its mix of arrogance and self-indulgence makes it less successful than it should be. This is mediocre Murphy. Colors were erratic as well. At their best, the tones appeared pretty lively, and the various settings offered a broad set of hues. However, at times the colors could be somewhat lifeless, so they lacked consistency. Blacks were a little too dark, and shadows tended to appear somewhat dense as well. Perhaps this is as good as the film can look, but I doubt it. Music showed good clarity and range, so bass response seemed quite warms for the score and songs. Effects seemed clear and accurate, though they also never stood out as especially memorable. Overall, the mix was fine for its age but not any better than that. How did the 2018 “30th Anniversary” Blu-ray compare to the original BD from 2008? Both were identical – literally, as the 2018 version just repackaged the 2008 one. Extras focus on featurettes, and Prince-Ipal Photography: The Coming Together of America runs 24 minutes, 39 seconds and provides notes from director John Landis, screenwriters David Sheffield and Barry Blaustein, costume designer Deborah Nadoolman, and producer/editor George Folsey, Jr.
“Coming” covers the movie’s origins and development, story, cast and characters, performances and improvisation, the “McDowell’s” elements, the movie’s legacy, and a few other details. On the negative side, the absence of any actors – especially Eddie Murphy – comes as a disappointment. Otherwise, this turns into a pretty good program. It gives us a rudimentary but interesting overview of some production elements and even hints at conflict between Murphy and Landis. No, it’s not a warts and all piece, but given the fluffiness usually found in this sort of retrospective, even a smidgen of that sort of material livens up the show. “Coming” works reasonably well. Next comes Fit for Akeem: The Costumes of Coming to America. The 18-minute, five-second show features Nadoolman, Landis, and Folsey. We get lots of information here about the clothes design for the film. Nadoolman comes to the forefront and gives us great insights into her choices and influences. This becomes a much more detailed program than usual and presents quite a few useful tidbits. For the 12-minute, 55-second Character Building: The Many Faces of Rick Baker, we hear from Landis, Folsey, and makeup artist Rick Baker. We learn about all of Baker’s makeups for the film and the ways his work influenced characters. Again, the absence of the actors makes the show incomplete, but Landis and Baker provide more than enough good notes to create an informative piece. Composing America: The Musical Talents of Nile Rodgers lasts 11 minutes, nine seconds. It features Landis, Sheffield, composer Nile Rodgers, Rolling Stone magazine’s David Wild, and Billboard magazine’s Gail Mitchell. “Composing” looks at Rodgers’ influences and goals for his score as well as time pressures placed on the composer. This is another productive program, as it gives us a lot of solid details related to the music. I could live without the praise from the journalists, though, as it’s unnecessary and gets some of the facts wrong. An archival piece arrives via A Vintage Sit-Down With Eddie and Arsenio. This five-minute, 38-second clip came from sessions to publicize the flick. This doesn’t include much concrete information, but it makes up for that with fun. It’s amusing to see the two comedians interact and riff off each other, though Hall gets in the best bits. 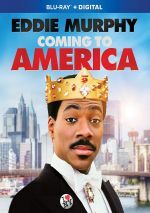 Eddie Murphy’s last genuine hit for almost a decade, Coming to America hasn’t aged particularly well. Too long and too inconsistent, the movie has some laughs but not enough to make it a winner. The Blu-ray provides mediocre picture and sound plus a generally interesting set of supplements. Paramount blew a chance to upgrade this old transfer for the movie’s 30th anniversary.